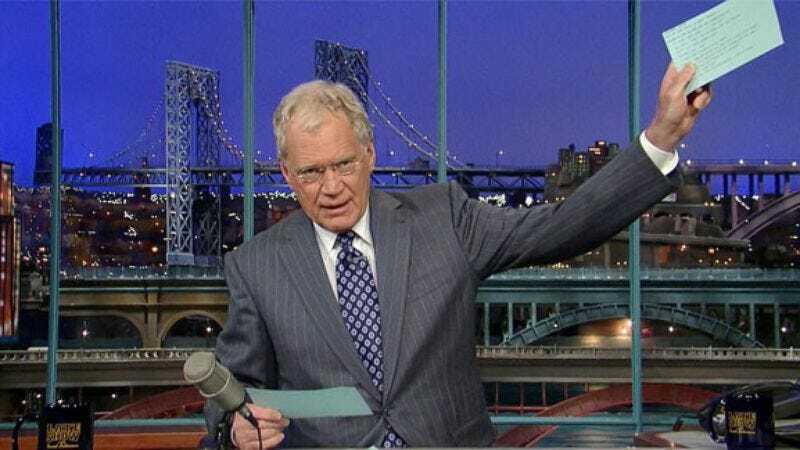 Despite some rumblings of retirement in 2013, all of the recent shifts in late night, and those episodes of Louie, David Letterman isn’t going anywhere. CBS confirmed today that it has extended Letterman’s contract to 2015, guaranteeing he’ll remain the host of the Late Show for at least two more years before he’s allowed to stop putting all of life’s foibles into list form, night after night, his head forever swirling with the numbers, the numbers, the numbers that demand to be mathematically assigned to quips about the day’s current events, the walls blanketed with hastily scrawled calculations that only lead him further and further away from cracking laughter’s code. “But I’m so close!” Letterman will cry before collapsing to the floor in 2015, his final equation of “Number 8: Miley Cyrus” doomed never to be completed. Less insane and more significant, this also means that Letterman will remain on the air long past Jay Leno (again), after the latter steps down in February. It’s unclear how much longer Letterman will stick around after that to compete with Jimmies Fallon and Kimmel, but either way, he's definitively won that whole "late-night war" now.